Smart mapping leader Esri today released a robust collection of web maps that display NOAA forecast streamflow data for the continental United States. Redlands, California—Smart mapping leader Esri today released a robust collection of web maps that display NOAA forecast streamflow data for the continental United States. Esri's multiscale web map applications allow users to view forecast water flows in real time at high resolution. The maps weave NOAA's recently released National Water Model data and Esri's ArcGIS functionality to provide interactive views of current and future water system behaviors. 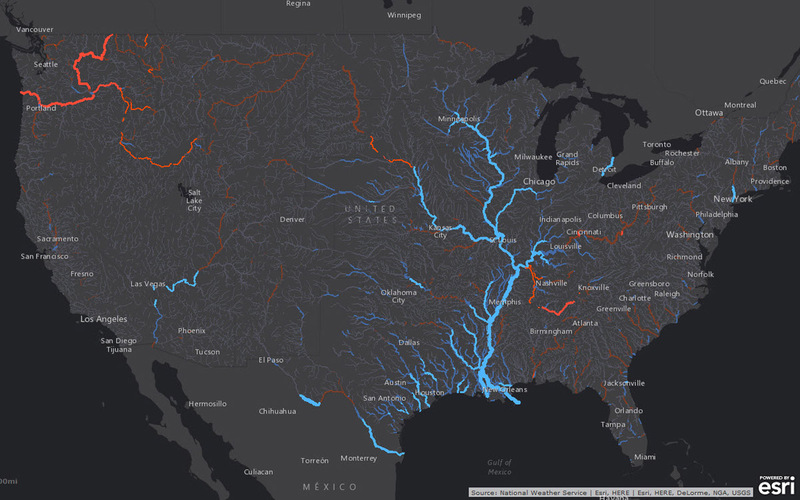 Esri maps the flow of water along 2.7 million stream segments in the US river network. These data-rich maps improve NOAA's ability to meet the needs of emergency responders, reservoir operators, ecosystem professionals, and floodplain managers by providing detailed information that can anticipate flood and drought conditions. National Weather Service data populates the interactive maps with hourly updates and forecasts for up to 10 days. "In collaboration with our academic partners, the Esri team supported the development process leading up to the launch of the National Water Model," said Edward Clark, director, Geo-Intelligence Division, National Water Center, NOAA. "We share a common vision for the value that high-resolution water prediction brings to the nation." Esri's new maps enable users to access a large amount of complex data quickly and easily. Although 10-day, midrange forecasts contain more than 200 million records and short-term forecasts require hourly data refresh, Esri maps automatically integrate and synthesize NOAA data so that users have the real-time information they need at the click of a button. "These attractive, accessible maps are part of our commitment to improving water awareness—a commitment we made at the White House Water Summit earlier this year," said Esri president Jack Dangermond. "ArcGIS provides a visually engaging way to communicate complex scientific information simply so that anyone can understand it."